The Snug-Up KIT is a full DenSureFit Kit…. PLUS an extra applicator of silicone…. Most people require 2 silicons to get snug on upper denture (1 kit). The full kit is used to get a great initial fit. What is the extra silicone and Snug-Up Tip for? Even when someone gets a great initial fit with DenSureFit, some people will get loose a few days or weeks later. What Might Cause a Denture to Get Loose After a Reline? What is a Snug-Up Application? 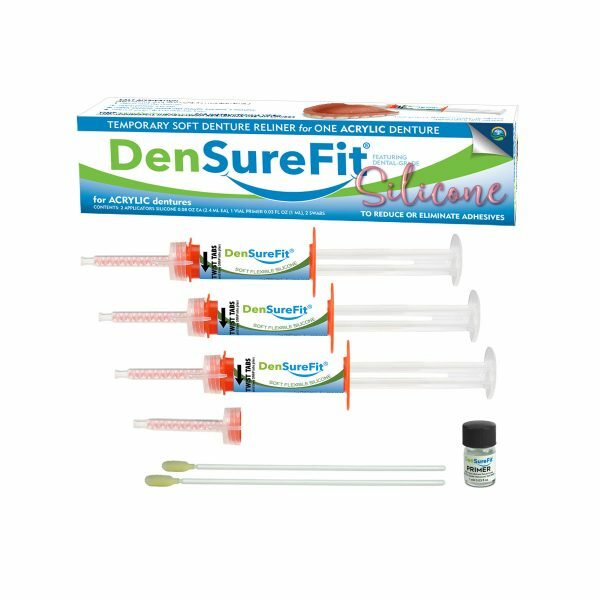 It is not always necessary to remove and reapply your DenSureFit liner when your denture loosens. More silicone may be applied over the existing liner around the middle of the wall/trough area to fill the new void and snug the denture back up again. This is called a Snug-Up application. The Snug-Up procedure is located in the instruction booklet. Note: The silicone liner must be in good condition and bacteria-free to add more to it. If it is not in good condition, it needs to be removed and start from scratch again. Good condition means that it is being properly soaked/cleaned in a denture cleanser daily; is not lifting; does not have tears). If your denture is very loose, you can use the entire applicator of silicone all at once for a Snug-Up. Save the Snug-Up Tip for future use. Or, instead of waiting until you get very loose, you can apply ½ of the applicator of silicone when you are a little loose (one line of silicone around the wall or trough of the denture) following the Snug-Up instructions in the booklet. Save the other ½ applicator for when you need another Snug-Up. Then, remove the used tip and screw on the new Snug-Up Tip. Apply the remainder to the wall or trough of the denture using the Snug-Up instructions in the booklet. Note: Leave the used tip on until you are ready to use the remainder. The cured silicone in the used tip keeps the remaining silicone in the applicator air-tight so that it can be used later. Is Primer Needed on a Snug-Up Application? Maybe…depends on if you have any areas on the edges of your denture that are not covered by silicone (the acrylic is exposed). Primer makes the silicone stick to your hard acrylic denture base. Silicone will adhere to itself without primer, as long as it is perfectly clean and dry. You do NOT need to prime on top of silicone. Doing so will just waste your primer. Only prime on top of exposed hard acrylic on the edges and slightly over the front of the ridge if it is not already covered with primer. You need that silicone to stick to your denture if it travels there during a Snug-Up application. DO NOT remove the partially-used applicator until you are ready to use the other half! When you are ready to use the other half, unscrew and remove the used tip. Screw on the new tip and use the remaining silicone immediately. The Snug-Up Tip allows you to use the first half of the silicone in the applicator and the remaining half at a later date. Now you can do 2 separate smaller Snug-Ups using ½ an applicator at a time instead of waiting to get loose enough to use a full applicator at once. This is especially beneficial for newer denture wearers whose gums are rapidly shrinking and need to make a series of smaller Snug-Ups in a shorter amount of time. It is also beneficial for those who have inflammation in the gums when their DenSureFit liner is applied. After the inflammation decreases, a void is left in the trough which causes a little looseness again. Then, a small Snug-Up application may be necessary to regain snugness.